The New England Conservatory Youth Symphony under Steven Karidoyanes offered Rachmaninov’s Vocalise, Symphony No. 8 in F Major of Beethoven, and Antonín Dvořák’s Cello Concerto in B Minor with the young and promising Mari Nagahara. As for the orchestra, I scored it a B with a caveat. Youth Symphony’s website had an 8 pm start-time, instead of 7, so, I missed the first half of the program. A fair turnout of mostly parents and friends took up nearly half of the Jordan Hall floor on Thursday evening. The 16-year-old sophomore from Andover Mari Nagahara came mighty close to nailing the technical aspects. Cutting Dvořák’s virtuosic passages, her speed would at times, amaze. Trills, arpeggios, and runs, especially both the chromatic ones and those double stopped, offered sufficient proof of her having already acquired an agile left hand. As to her right hand, her bowing, flowed and was noticeably strong, seldom shaking or scratching. Intonation was spot aside from some very rare slips mostly taking place high up on the A string. Her vibrato sounded natural. All in all, certainly auspicious. As to interpretation, her youth must surely be considered. Throughout the 40-minute concerto there were moments where emotion belied her age. Mostly, her dynamics were generalized, sometimes on account of the orchestra’s overplaying. Unsurprisingly, articulation and singing are still in the formative stage. Her robust delivery of the first theme in the opening movement was mostly convincing, though it verged on rigidness (The fact that I would make the same observation of Jacqueline Pré’s recording with the Chicago Symphony suggests how far Miss Nagahara has already come.). The Finale’s folk-like tune missed idiomatic enunciation of its cultural heritage. 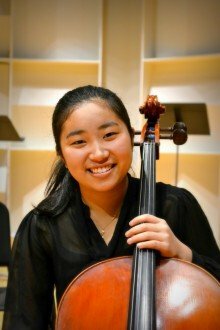 In the middle, Adagio, ma non troppo, with its lyricisms coming in fragmentations, Nagahara sought after breath, and when her instrument sighed, it was clear what lies on the horizon for so serious—and accomplished—a youngster. The huge string section of the NEC Youth Symphony occupied most of the stage. High strings received more attention, and rightly so, as they were impressive. Karidoyanes would neglect the low strings such as in the Finale where they partake in a dialogue with the violins. The wind section in general did not blend together; this was most obvious in the Adagio. The low brass did; they were a treat to hear whenever they played. The timpanist was a bit shy. Overall, I was expecting a clearer, cleaner performance, one more rigorously sculpted. This summer the NEYCYO’s advanced young musicians, most between the 13 and 18, will tour Ireland, giving their final performance at the National Concert Hall in Dublin.